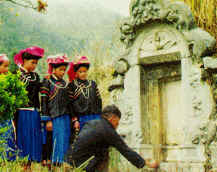 With a 400 population, the Pu peo live in concentration in the Sino-Vietnamese border region in Dong Van, Yen Minh and Meo Vac districts, Ha Giang province. They are also called Ka Beo, Penti and Lo Lo. Their language, close to that of the Co Lao, La Chi and La Ha, belongs to the Kadai Group. The Pu peo economy is mainly based on burnt-over land and terraced fields. grown with maize, rice, rye and beans. Farm implements include ploughs and harrows and buffaloes and oxen serve as draught animals. The staple food in daily meals is steam-cooked corn flour. 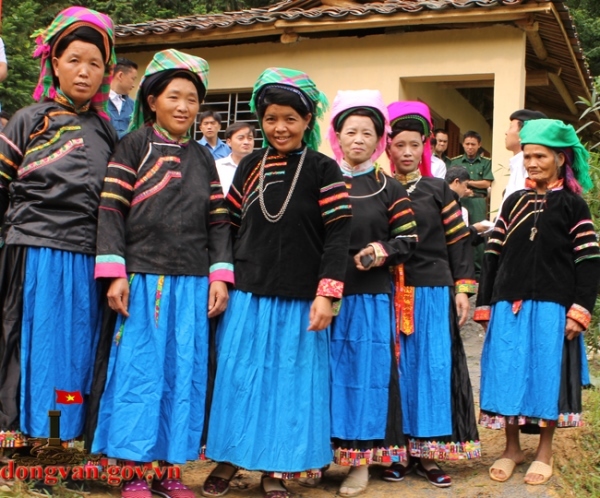 The attire of Pu peo women still retains its national color manifested through their hail style, scarf, jupe, vest and apron; pieces of cloth of different colors are sewn to make colorful designs. Men dress like other ethnics in the region. Houses are built on the ground in tiny clusters by the side of the Hoa and Mong. Each family lineage has its own system of middle names given to successive generations. Young men and women of various lineages enter into marriage according to matrimonial customs: If a young man of A lineage marries a young woman of B lineage, then the young man of this B is not allowed to get a wife in that A lineage. Many people of other ethnics have become daughters-in-law or sons-in-law of Pu peo families. The groom's family seek marriage for him and after the wedding party, the bride joins the family of her husband. The Pu peo family follows the patrilineal system, and the father or husband is the husband is the house owner. Funeral rites comprise the burial ceremony and offerings. The Pu peo attach great importance to ancestral worship. On the altar are often placed small earthen jars, each jar symbolizing a generation. Besides wedding parties and funerals, the Pu peo hold ceremonies to pray for peace and the opening of the new working season at the New Year in the firs half of the 1st lunar month, and observe the 5th of the 5t lunar month festival. 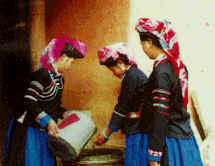 The Pu peo are one of the few ethnic groups still using bronze drums, but not widely as in the past and now only at rituals. In Pu peo customs, there are male and female drum set in pairs. The two drums face each other and a person standing in between beats them at funerals. Although the Pu peo are not large in population, yet the constantly join other brotherly ethnic groups in national building and defense and in the strengthening of the security of the national frontier.